How to manage 21st century cities (2008). Book. Pearson FT.
Branding Madrid: From ‘Madrid Global’ to global Madrid with María Cristina Mateo (2010). Chapter in „Towards Effective Place Brand Management Branding European Cities and Regions” edited by Gregory Ashworth and Mihalis Kavaratzis. Edward Elgar. Different branding strategies from the use of the territory of origin by commercial brands: the brand-territory matrix (2010). Paper. Journal of Town and City Mangement. Henry Steward. We, the cities: urban strategies for an ethics of care or what to do when my star projects become white elephants (2009). Paper. Analisis Local. Participation in diverse international research projects centered on competitive urban strategy, urban management indicators and consulting projects for the urban and regional development of diverse cities and regions, including Madrid, Zaragoza, Cuenca, Segovia, Barcelona and the regional authorities of Galicia and La Rioja. He has also participated in multilateral organisms like the Asian Development Bank, the OECD, The Spain-Japan Forum, The Spain-China Forum, the Asia Europe Foundation, Asia Europe Foundation (ASEF), the International Society of City and Regional Planners (ISoCaRP) and regional and local governments in diverse countries (including Austria, India, Singapore, Russia and Romania). Regular speaker in mainstream forums on urbanism, a member of scientific committees and reviewer of leading congresses related to urbanism (REAL CORP, ISoCaRP, Territorios21, Spanish Regional Science Association or CityMarketing) and makes frequent contributions to the media. 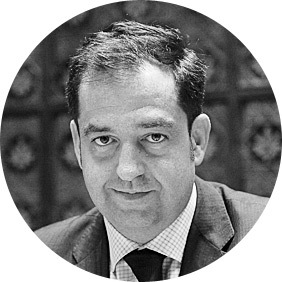 In 2006 he was a member of the scientific committee for the city of Madrid at the OECD conference on “What policies for globalizing cities?” In 2008 he was the keynote speaker in Dublin at the 48th General Assembly of Capitals Cities of the European Union.